Salvation And Survival: Forward March! I don't know about you, but I'm in need of a little pep talk; I am literally sick and tired of letting this world dictate my status and condition. If I listen to our culture, or our national leadership, or our enemies at home and abroad, then I may as well give up and pull the blankets over my head --- I'm already defeated! But I suggest to you that it's time to take our eyes off this world and realize that what we see all around us is an illusion that evil is winning. We must stop listening to who the world tells us we are, and become who we sometimes casually refer to ourselves as ... true brothers and sisters in Christ. That's not a cavalier statement, so please don't stop reading -- instead, stop and think seriously about that identification. I know that it doesn't carry much weight in this age of celebrity and technology. In fact it sounds like an old-fashioned and irrelevant term; an archaic religious title that belongs to centuries long past, and which offers no prestige in our superstar-obsessed society. But I want you to take a couple of minutes and honestly contemplate these questions I'm about to ask you. Don't rush through them, but allow the significance of each to speak to your heart ... Do you believe that 'Jesus is the Son of God' is a true statement? Do you accept Him as your Savior from the penalty you deserve; that He died on the Cross as payment for your sins (past, present, and future) so that you might live in eternity with Him and our Father in Heaven? Do you believe that His resurrection has conquered Satan's plan to destroy our relationship with our Creator by leading us to an eternal Death? And finally, do you accept that you are a child of God -- a chosen, adopted, and blessed co-heir with Christ; that you are destined to inherit the Kingdom of God? If you can answer "yes" to those questions, and can determinedly follow that train of thought, then it should be obvious that in God's eyes, you are truly a brother or sister of Christ's. Christ is the "begotten" son of God, meaning, in Hebrew, that He is from the lineage of God; he has been "brought forth" by God. In the Greek, it means that, as the Son of God, Jesus was the sole representative of the Being and the character of the One who sent Him. As a child of God, and a co-heir with Christ, you and I share that same lineage in our "rebirth"; and we are the sole representatives of God/Jesus on this earth. That alone should make us lift our heads high! So why do we feel so defeated in these days? And believe me, I am as guilty as the next person of succumbing to the lies that Satan and the spiritual realm are so clever at whispering in my most vulnerable moments. But I want to share a simple truth that my wonderful husband discovered in his Spirit-inspired study of spiritual warfare. We are all familiar with the Armor of God that Paul tells us to put on in Ephesians 6. And I am faithful to arm myself each day with the Truth of God, my Salvation, the Peace of God, the Righteousness of Christ, the shield of Faith, and the Word of the Lord. But for the most part, I use each of these weapons as a defense against the onslaught and advance of Satan in the world. As the culture launches another aggressive act against my Christianity; and the news media reports another heinous crime; or the economists forecast a worldwide crash; and the terrorists are upping their rhetoric against Israel and the US, I react in a defensive mode, wrapping myself in my armor, fending off each new fear or threat with the weapons from God. Other than the Word of God, which I can use to strike out against my attackers, I am relying on defensive weapons to protect myself. What my husband, Peace-Loving Warrior, showed me was that as the sole representatives of God's kingdom on earth, we are obligated to go on the offensive! Christ has already won the Victory! With His resurrection, Satan's weapon of Death was defeated! And look at our battles from this perspective ... whoever won a war by being defensive or holding their ground? The army that advances -- and goes on the offense -- is the one that gains new ground against the enemy. Right now, we Christians are feeling great oppression against our faith. The Supreme Court has ruled against Biblical marriage; Christian business owners are being sued for defending their faith; fellow Christians around the world are being persecuted and murdered. In response, we Christians are so worried about trying to keep Satan out of our world. But what we should be doing is going on the offensive so that Satan has to worry about keeping US out of his world! How many of our thoughts run along this course: "I wonder where Satan is going to strike us next?" Can you see how much better it would be if Satan was kept off balance, wondering where Christians were going to attack next? You see, Christ has already beat the Devil; the Enemy just doesn't know it yet. 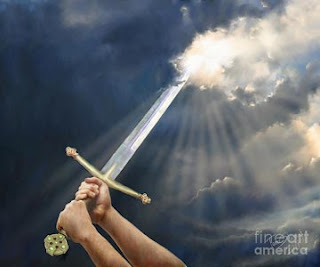 It's right there in Colossians 2:15: [God] disarmed the principalities and powers that were ranged against us and made a bold display and public example of them, in triumphing over them in Him and in it [the cross]. Can you see that Jesus won the victory on our behalf? That His victory over the principalities and powers is our victory? We don't have to become depressed and scared about what we see going on in the world, or the future! Yes, it might become a bit (or maybe a lot!) uncomfortable for us for a short time, but Jesus has given us His Authority to exercise an effective campaign against the Enemy, who has only that short time left. Christ has already won the eternal victory, but as our commander-in-chief, he has given each of us an assignment: to make a bold display and public example of that victory by how we live our lives ... representing His character and mercy and declaring our conviction of His righteousness. So the next time you are overwhelmed with sadness or fear or doubt, just picture yourself in full armor, running headlong toward the retreating enemy! Make a public declaration of your testimony -- even if it's only spoken out loud in the privacy of your home (I promise you it will send the enemy in full flight). Whenever you have the opportunity, go on the offensive -- shout out a praise when you are driving in your car; pray Psalm 18:2-3 out loud; and preach the Word to someone who needs it. You will find that Satan's spiritual troops have left the battlefield in the face of your organized and forceful attack on their territory. Let's make a commitment to each other. From now on, no more retreating! We've been given our marching orders and we cannot be defeated. At the sight of our enemy, we will go on the offensive and storm the gates of his strongholds. We can defend ourselves, when need be, with the full armor of God, but we know that we have the additional weapons of boldness and surprise in our arsenal. The Devil doesn't know who he's messing with! I owe a debt of gratitude to the inspiring words and knowledge of author Derek Prince in his wonderful book, "Spiritual Warfare". 2 Corinthians 10:4-6 "For the weapons of our warfare are not carnal but mighty in God for pulling down strongholds, casting down arguments and every high thing that exalts itself against the knowledge of God, bringing every thought into captivity to the obedience of Christ, and being ready to punish all disobedience when your obedience is fulfilled."